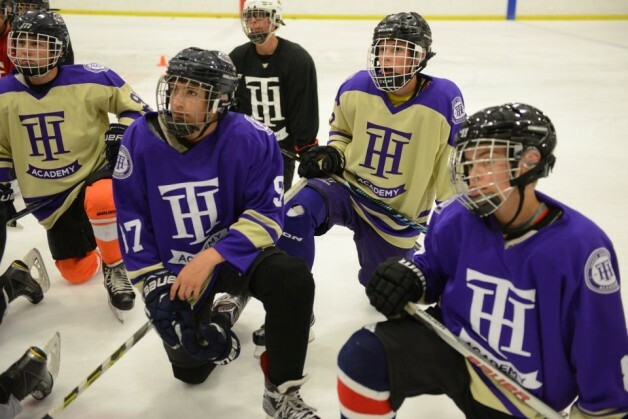 After months and months of planning, the doors finally opened at Tahoe Hockey Academy last month, and things finally started to seem real when the academy played its first games in late September. Donning its purple and white uniforms for the first time, the team traveled to Winnipeg the last weekend in September and opened their inaugural season in the first WPHL showcase against some of the top teams from the Western United States and Canada. The team opened its inaugural season with a win Sept. 30, beating Fountain Valley 5-4 in overtime. Tahoe led 2-0 after the first period and 3-0 after the second. They extended their lead to 4-0 in third, but Fountain Valley rallied and tied the game with seven seconds left in regulation. Forward Eric Larsson scored on an assist from Riley Fenn with 1:36 left in overtime to lift Tahoe to its first victory. Larsson totaled two goals in the victory, Jared Shuter scored a goal and Shane Gilbert also scored. Jack Birecki scored the team’s first goal, walking in on a 1-on-2 and blasting a shot in from just inside the blue line past the goalie only six minutes into the game. Alan Garcia added two assists. On Oct. 1, Tahoe fell to SISEC, an international hockey academy out of Calgary, 4-1. Gilbert scored the team’s only goal, assisted by Jack Tuszynski and Matt Odom. Later that day, Tahoe fell to the Pilot Mound Buffaloes, the host team, in a very physical game by a 6-3 mark. Larsson scored two goals in the defeat and Shuter added another. Zach Dill had an assist, as did Zack Savarise. With a very short turnaround time between games, Tahoe was without three players against Pilot Mound. More than half the team’s roster is freshmen, so Fenn knows there is room to grow as the season goes on and into future seasons. The first weekend in November, Tahoe will fly to Chicago to compete in the prestigious Bauer World Hockey Invitational, where they will face teams from all across the United States. “We’re ecstatic about it,” Fenn said. “The first weekend exceeded all our expectations, and now we’re really excited to go play in the ADHSHL and to compete in some great tournaments. The boys were thrilled to get their uniforms and equipment, and it’s really coming together.